She was born in 1984 in Novosibirsk. She graduated from Novosibirsk State Art School in 2007. She was awarded a qualification of painter. A member of Creative Union of Artists of Russia and International Federation of Artists since 2013. 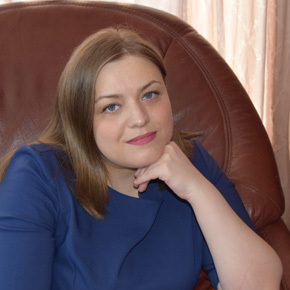 A member of Novosibirsk region “Union of Artists” since 2015. More than 100 publications in media. Donated more than 70 artworks to 45 museums. Silver medal of the Russian Academy of Arts. Gold, Silver, Bronze medals of Creative Union of Artists of Russia. 20 diplomas from Russian Academy of Arts, Creative Union of Artists of Russia, Union of Artists of Russia and Novosibirsk region “Union of Artists”. More than sixty letters of thanks from authorized representative of RF President for the Siberian Federal District, Russian Culture Fund and Russian Academy of Arts.